I’m going to do a crock-pot Coconut Curry with Cinnamon with the Eye of the Round. I’ll do something with ground beef on Friday. TMOTH will do something with the chicken. We’ll fill in on the other days with beef from the John Ford Ranch and Wild Caught Alaska Salmon from Trader Joes. I still haven’t received any eggs in my CSA. This is the third week in a row. I believe I’m supposed to be getting them every other week due to short supply. I’ll have to check with the farm and see what is up with that. This entry was posted in Locavore and tagged Airedale, Paleo diet, sustainable food, Tara Firma Farms. Bookmark the permalink. I don’t know where you’re located but I found Darling Farms stand on Petaluma Hill Road across from Roberts Road (near SSU). They have pastured eggs for $5 a dozen, best price I’ve found so far around here. Seasonal produce available too. Thanks Jan! I’ll definitely check that out. I buy fresh strawberries at that intersection. I try to feed them on the whole carcass principle. Google Tom Lonsdale and Raw Meaty Bones for more detailed info. I would think that yopu have some wonderful things to feed your dogs. There was also a hysterical post made years ago in a raw feeding group about a woman who gave her dogs an elk carcass and what ensued. I’ll see if I have a copy in my email at home and forward if I do. The way my feeding looks daily is that Queen Barktifah (who is an easy keeper) gets 12 oz of food each day. Muffie Stuffie Sucker (a hard gainer) gets 16 oz. 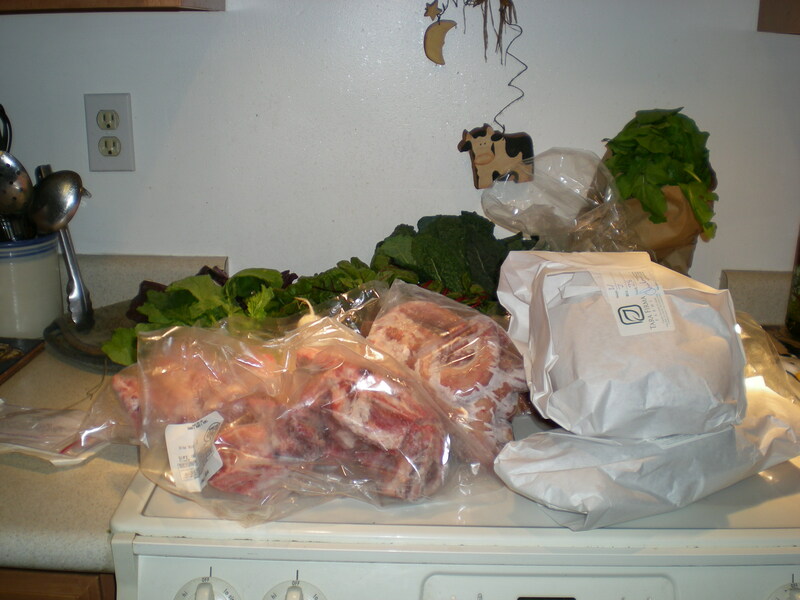 I feed a mixture of pork neck bones, general pork bones, chicken backs and necks, turkey necks and offal. Right now they are getting beef heart jerky as training treats (I made this last week). This seems to be working for us. I started when they came to live with me as puppies.